Imagine teaching a drum corps with an average age of about 10.5! How do you field a program that's both fun for the members and entertaining for the auidence? 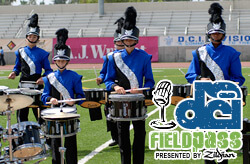 Blue Devils C corps director Rick Odello along with the corps' members and parents tell Dan Potter how they do it in today's edition of the Field Pass presented by Zildjian.